Fortunately for us, the router is an extremely low-maintenance tool, but there are a few obvious things we can do to keep it in good condition. First and foremost, keep an eye on the plunge legs. New routers often feel and sound very dry and stiff when you plunge them. This can soon be remedied by cleaning off any hardened grease with cutter cleaner or WD 40, lubricating with a PTFE spray and pumping the router up and down for a few minutes. A few such treatments in the first weeks of the router’s life will work wonders. Routers that can be stood upside down can be pumped in this position. Some models have plastic or rubber gaiters to help keep the dust out. 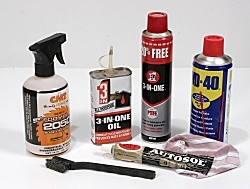 These models can be lubricated with a thin coast of oil such as 3-in1. For more drastic cleaning, some routers can be lifted off their plunge legs. Small models with plunge springs external to the legs are particularly good candidates for this, but you can also do it with some of the more sophisticated models. However, be careful not to lose the plunge locking ball or pellet. 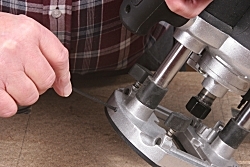 With routers like the Hitachi M12V and DeWalt DW625, some users remove the plunge springs when the router is used in a table to overcome their resistance when setting depth of cut. With the PlungeBars or the RouterRaizer I’ve never found this necessary. If they get tarnished, the plunge legs can be cleaned with metal polish. 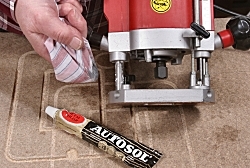 I use ‘Autosol’ paste polish, available from Halfords and motor accessory stores. 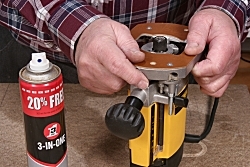 This treatment is particularly useful for hardened chrome plunge legs such as on the DeWalt and Trend models. ‘Autosol’ also has a lubricating effect. 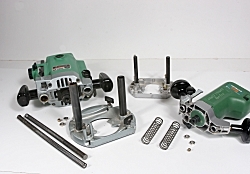 Some routers have their plunge legs fastened to the base casting by means of Allen screws or machine screws. If these are loose on delivery, or work loose in use, there will be a perceptible wobble in the router, even when the plunge lock is fully tightened. If need be, tighten the screws but don’t be too heavy-handed. With some models these screws are inset and not immediately obvious.